We were having such beautiful Spring weather this past week then suddenly a cold front decided to move through and with it brought some freezing temps. At least it wasn't the snow some of you are still experiencing. But I have a brand new hydrangea bush and it had such beautiful blossoms on it I didn't want them to freeze. So I decided to bring them in and enjoy them indoors. I placed one stem in each of four milk bottles that I tied with twine. Then I placed all four bottles in a galvanized trough I had painted with black chalkboard paint. You can read about my obsession with painting metal containers lately. I decided to place the trough on my French sewing table I painted last year. I love how vintage this table looks with the stenciled words. I then place a mercury votive candle holder on top of a stack of old books sans covers tied with raffia. Next to them I placed my favorite vintage looking bird. 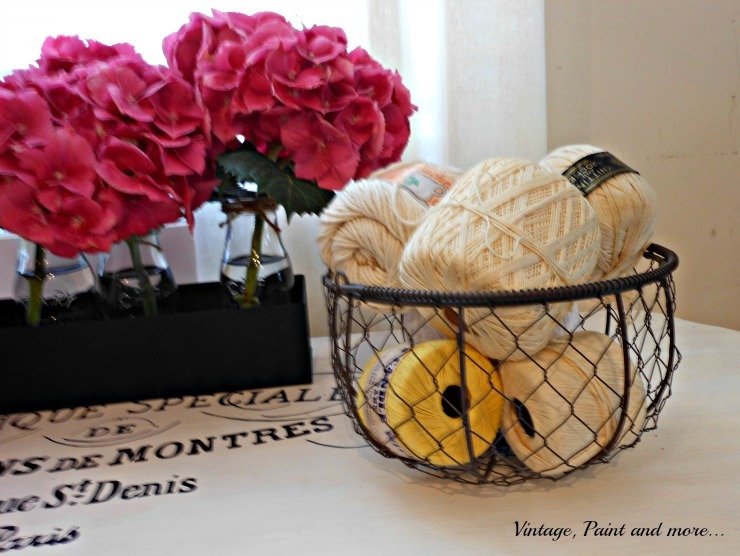 To the right of the trough I placed a vintage looking wire egg basket I found at WalMart for $5. I filled it with balls of crochet thread and yarns in neutral colors. I am so happy now that the cold front came through and forced me to bring these lovely ladies in. I love how the bright pink contrasts with all the whites and neutral colors making such a beautiful statement in a usually ignored corner of our kitchen. How have you brought Spring into your home - did Mother Nature have a hand in it. Tell us about it in the comments below. If you want to make sure you don't miss out on anything I share please sign up for my emails in the Hello bar at the top of the page. I will be linking up to the parties listed on the Where I Party page. 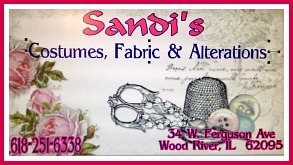 Please stop by and visit them. 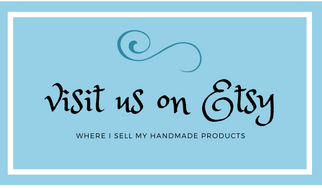 You will love all the creativeness and inspiration you find there. My hydrangeas are beginning to green up - I hope I have some blooms to show off. I love the way you have styled them. I bought a beautiful little hydrangea yesterday and have fallen in love with it. Yours are so robust! 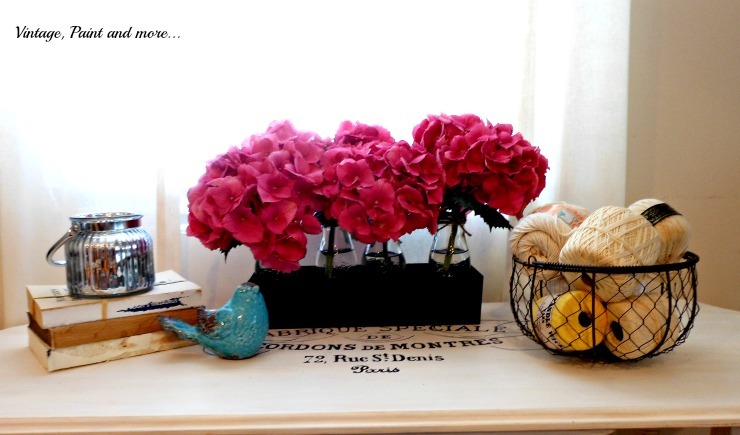 Such beautiful color, it complements any space and I like how you styled them. Beautiful hydrangeas! Thanks for sharing your great vignette at Motivational Monday! Hope you will link up again tonight! 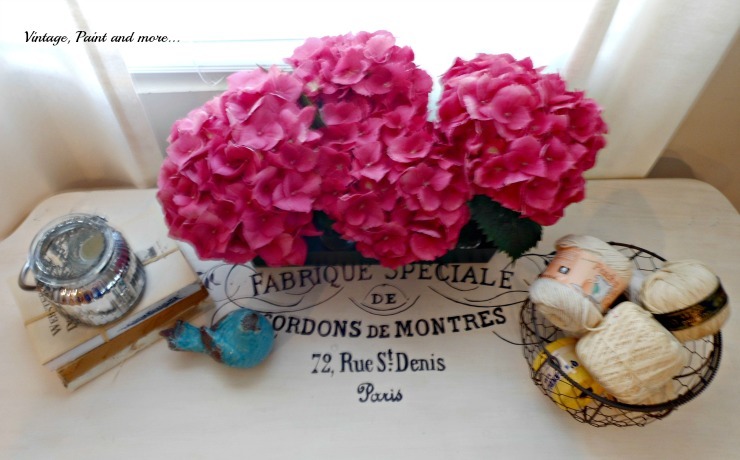 beautiful hydrangeas ... lovely vignette. 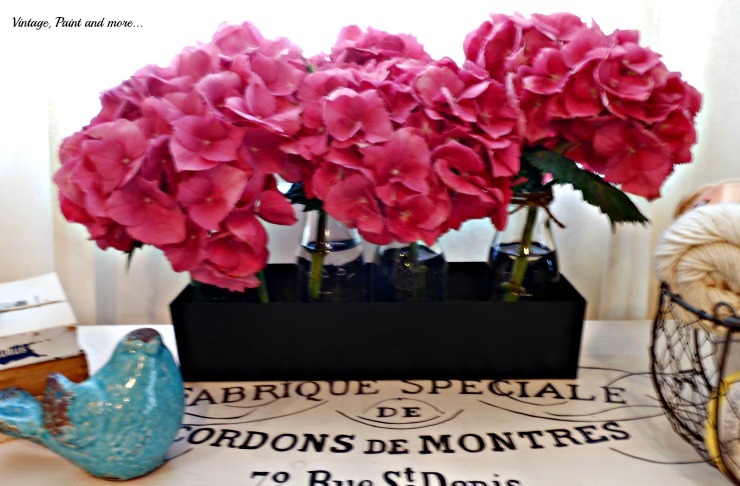 Your hydrangeas are stunning Cathy and they look perfect in your trough. I had a nice small crate filled with spring flowers (tulips, etc. ), but they are long gone now! The tips of my Iris got some frost bite but they bloom much later so we'll have to see how the late snow will affect them. 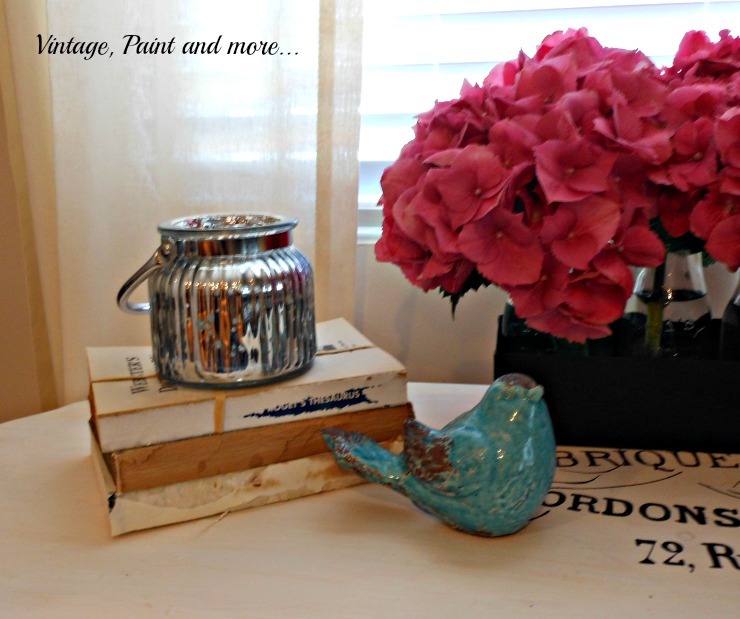 Thanks so much for linking up with Vintage Charm!